Located on the southernmost tip of Hainan Island, Sanya is the most famous tropical resort in China, wonderful in the baking summer months and also a popular spot in winter too. Sanya stands the latitude between 18-09 and 18-37, almost the same as Hawaii. Thus, it's often called "the Hawaii of China" or "Orient Hawaii". Sanya is a great place to soak up some seaside atmosphere and the night market here is especially vivid with seafood thrown on the streets, stores selling all types of weird and wonderful wares and huge tea warehouses, all adding to the lively feeling about this place. With its ancient name of Yazhou (literally means cliff state), the history of Sanya can be dated back to Qin Dynasty (221 BC - 206 BC, some 2200 years ago). Since then, it is always within the territory of the following dynasties of China. Being the tropical Ultima Thule of China, it is so remote from the capital of China that it is always called Tian Ya Hai Jiao, which means the end of the sky and ocean in Chinese. Some Prime ministers in various dynasties were here in exile and an enlightened monk named Jiangzhen accidentally sailed here and used this place as one of his harbors for his long Buddhism-missionary journey to Japan. 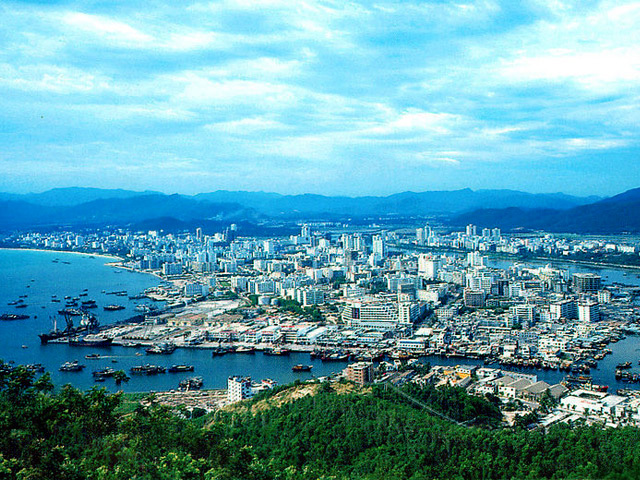 On September 26, 1987, Sanya was established as a city by the approval of the State Council of China. Sanya Phoenix Airport lies 20 km (12 miles) from the city center, offering service to 23 domestic destinations including Beijing, Shanghai, Guangzhou, Shenyang, Wuhan, Qingdao and Shenzhen. International flights offer service to Singapore, Macau, Hong Kong, Malaysia, Thailand, and Tokyo. New arrivals can take a taxi (you may ask the driver to take Yanhai Lu, which follows the beautiful coastline) or a bus to Sanya Bay or Dadonghai Bay. If you have enough time, or if you want to get closer to the island sight, shuttle bus is your prime choice-easy and cost-effective with broad network. There is shuttle bus heading for between Sanya and Haikou every 20 minutes during 7am to 6pm while change to be every hour during 7pm to 11pm. Besides, there are more than 20 runs between Sanya and mainland province like Guangdong, Guangxi, Hunan, Jiangxi, etc. Taking a train would be good for travelers with enough time and want to see more on the way, also to experience the China's first cross-straits passenger rail link from Guangzhou, Guangdong Province, to Haikou and Sanya, Hainan island. Traditional way is taking a boat from Guangdong or Guangxi province to Haikou, Hainan Island. To date the Sanya International Wharf has come into use. Currently a route has been opened for Hong Kong'sanya"Vietnam Halong Bay"Hong Kong, Which visits Sanya at least 6 times a month. Transportation in Sanya is very convenient. The buses will lead you to every county and region in the city as well as every scenic spot and area. Their main line is from Dadonghai to Minhang station with a distance of 10 kilometers. The bus will stop at the stations in or at your waving it down to board. Also, new tourism lines have been opened from the city center to Yalong Bay, the Tianya Haijiao and Nanshan Cultural Tourist Zone. Sanya has altogether more than 1000 taxis providing passengers with sound service. Bargain is allowed if you are taking a long distance to scenic spots. Generally speaking, from city center you have to pay RMB25 to Sanya Bay, RMB10 to Dadonghai beach and RMB 50 to Yalong Bay. It is a good choice to rent a car to drive around Hainan Island. You rent your favorite one from more than 30 kinds of cars and minibuses, varying from the most economical to the most luxurious like Benz with a daily rent fee from 160 to 1500 RMB. You may need a deposit to rent one.